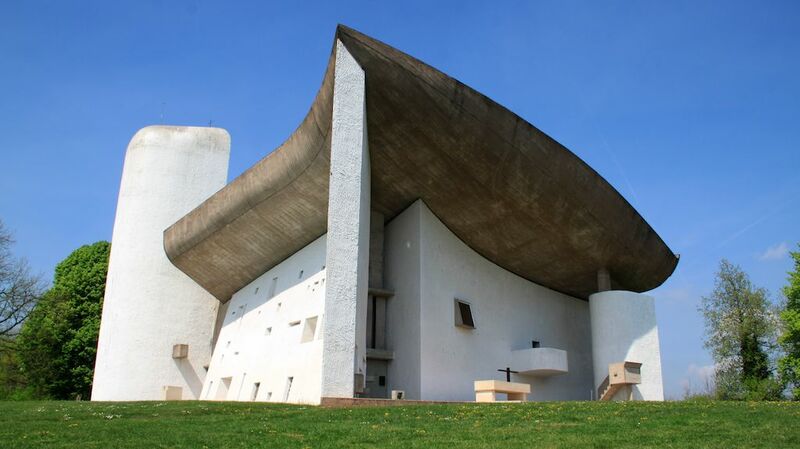 The iconic post-modern Chapelle Notre Dame du Haut de Ronchamp designed by Le Corbusier is a popular site for religious pilgrims and architecture lovers. The whitewashed concrete post-modern Chapel of Notre Dame du Haut in Ronchamp, France, is one of the most instantly recognizable designs of the twentieth century. 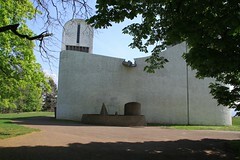 The small chapel was designed by the Swiss architecture Le Corbusier and constructed in the mid-1950s. Ronchamp is a bit off the beaten track in the French département Haut Saône in the région Franche-Comté near the cities Besancon, Belfort and Mulhouse. Admission is charged. The iconic Chapel of Notre Dame du Haut in Ronchamp in Franche-Comté designed by the Swiss architect Le Corbusier is despite its small size one of the most famous mid-twentieth century buildings in the world. Le Corbusier initially declined an invitation to design the church but then became inspired by the site on a hilltop that offered views in all four wind directions. The design is not typical Le Corbusier rational functionalism but rather an early postmodern design in a sculptural style. 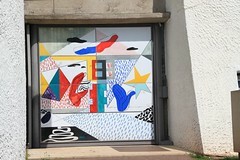 Attempts to have the chapel together with other works by Le Corbusier inscribed on the UNESCO World Cultural Heritage list have thus far failed. The next attempt will be made mid-2016. 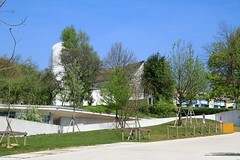 The Chapel of Our Lady of the Heights is on a hill (colline) around 150 m higher than the church in the village Ronchamp. The Le Corbusier-designed chapel was consecrated in 1955 to replace a pilgrimage chapel destroyed during the Second World War. The Chapelle Notre Dame du Haut measures around 30 by 40 m on an irregularly shaped floor plan. It has an interior space for around 200 worshippers, while a second outdoor altar on the eastern side allows services for over a thousand visitors. The walls are mostly whitewashed concrete, as restricted access required most of the structure to be produced onsite. Stones from the former church were also used in the construction as well as for rubble to fill the space between the two concrete membranes that form the very thick southern wall. This up to 2.72-m thick southern wall is pierced by 27 rectangular windows of various sizes in clear or colored glass. These window frames allow soft light to be reflected at a variety of angles throughout the day. The large enameled door in this wall is used only for special pilgrimage events such as August 15 (Assumption of Mary) and September 8 (Nativity of the Virgin Mary). The concave eastern wall offer the setting for outdoor services. Note the 17th-century Mary statue, which was rescued from the former church, in a glass box in the wall. She can be turned around depending on whether the service is held inside the chapel or outdoors. The massive grey roof of the chapel rarely fails to impress. The shape has been described as a large mussel shell or mushroom hat. The roof rests on pillars, rather than on the walls, which gives the impression of the roof floating in the air. This is especially noticeable in the interior where the clerestory windows fitted between the top of the walls and roof provide much of the lightening. The roof is mostly drained through two large sculpted pipes at the rear of the chapel. During rainstorms water gushes down from the roof through these post-modern minimalist gargoyles to form a modern waterfall fountain. The church has three towers of between 20 and 27 m high. These provide space for chapels inside the church and are lit through windows fitted below the cement canopies. 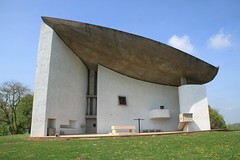 The chapel has no bells – Le Corbusier was in favor of an electric sound system but it was never installed. A separate open campanile designed by Jean Prouvé was installed during the 1970s near the eastern side of the church. 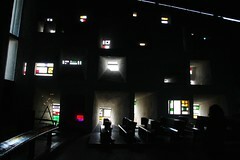 The interior of the Chapelle Notre Dame du Haut de Ronchamp is similarly to the exterior simple with rough white walls and very limited decorations. The main nave is around 25 by 13 m with the floor following the natural uneven slope of the hill towards the main altar. Eight rows of wooden benches were added at the insistence of the church authorities – Le Corbusier would have preferred worshippers to remain standing. The most impressive part of the interior is the southern wall lit by the 27 windows in the very thick wall. These window frames are more like small tunnels through the thick wall; positioned at different angles, they allow soft light to reflect at various intensities throughout the day. Further side altars are at the base of the two northern towers. These are lit through windows fitted at the top of the towers. 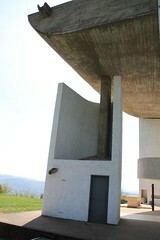 Apart from the chapel, there is not much else to see on this hill above Ronchamp. The small Pyramid of Peace was also designed by Le Corbusier and is mostly constructed from rubble from the previous church. 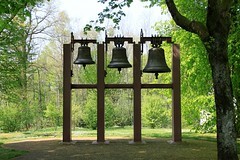 It is a memorial to the soldiers who died during the liberation of Ronchamp in September 1944. A modern monastery was built into the hill in 2011 to house seven nuns. The project has been heavily criticized for ruining the appearance and the acropolis-like approach to the chapel but the construction is not particularly visible or interesting. The monastery is not generally open to casual visitors. The opening hours of the Chapelle Notre Dame du Haut are daily from April to October from 9 am to 7 pm and from November to March from 10 am to 5 pm. The chapel is only closed on January 1. The Le Corbusier chapel is privately owned and thus one of few places of Christian worship in France that charges admission fees. Admission tickets are €8 (€4 for children 8 -17) – fairly expensive given that full museums and cathedrals filled with art can be seen for less. Audio guides are €2.50 while further guidebooks and pamphlets are available in the bookshop. There are hardly any signs at the chapel or pyramid to explain any of its significance but just a little prior research will give enough information for most visitors. Apart from the chapel, there is really very little to see at the site. Visitors not particularly interested in modern architecture or worshipping may be done in a few minutes – admission is possible up to as late as 30 minutes prior to closing time. Ronchamp is a bit off the beaten track but getting there is easy by car while trains also run to Ronchamp, from where it is a steep 20-minute climb to the top of the hill. Ronchamp is only around 20 minutes by TER train from Belfort. However, there are huge gaps in the schedule. See schedules at Voyages SNCF. 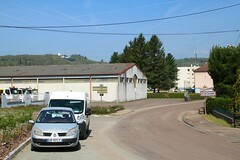 Ronchamp is on the N19 road between Belfort and Vesoul. The closest autoroute is the A36 between Besancon and Mulhouse via Belfort and Montbeliard. Signposting to the chapel is clear from the center of Ronchamp. The final road access is via the narrow but tarred Rue de la Chapelle, which turns uphill from Rue le Corbusier directly across the road from the Tourist Information Office.